This are REAL customers saying REAL things! Dan, his wife and his friends came here for a wedding, I joined them from the airport to many many places in this amazing city during four days. See their video and check how much fun they have got!! I brought this kind Family a whole day of touring in Buenos Aires. I specifically tried to get the youngest part of the expedition happy and entertained!! Thanks my Australian Friends for your kind words!! I picked up this two couples from the cruise terminal, and we spent a whole day in my lovely city. The ladies (Barbara and Frank's wife) where tooooo shy to appear in the video, anyway Barbara sent a nice written reference. Thanks Merideth for your kind words! Daniela and me enjoyed very much your company. The flower you see in the back,is one of the modern icons of Buenos Aires.We did two looong days with Merideth,a kind curious lady that runs a coffee in Mistic. 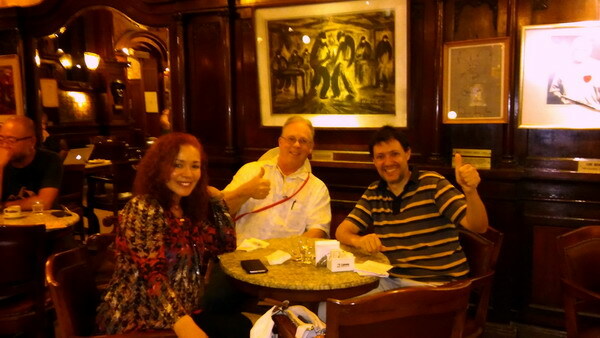 We did a "fixing the holes" tour, Eric and his wife had spent 8 days in Buenos Aires, I brought them a short view or our history and I show them hidden fun places, as the Victorian Railway Station where I recorded this video Thanks Eric! Thanks Taj! Michael and Sandra are from Stuttgart, we got a lot of fun as you can see in this video! See this video about the Megan's from San Francisco California! They are a travelled Family related with Advertising, Finances and Health Care. Real Customers, Real World! "My wife and I planned our visit to Buenos Aires ahead of time with Pablo, who took the trouble to research and respond to all our questions, from the wreck of the German pocket battleship Graf Spee in Montevideo to the best tango shows and wine tastings, to the location of a Japanese garden that my grandfather visited as a sailor in 1921. He even looked up the specifications of the 1898 sail training ship “Sarmiento” for me, as I was a naval architect and love marine history (especially that period of history). Pablo is a gold mine of information on the history, culture, architecture and interesting sites throughout the city, barrio (neighborhood) by barrio . And, he seemed to know EVERYONE everywhere we went. Pablo made our travels through the city effortless as he charmed taxi drivers, waiters, other guides and other locals. It was more like seeing the city with a friend of the family than with a tour guide. We really enjoyed the local restaurants he took us to. They had great local food and atmosphere and were not the tourist traps we try to avoid when we are on our own. always to greet you Friends! I'm an independent traveler, and before setting sail for Argentina, I did copious amounts of research (...) Pablo skillfully organized every single request we made into a comprehensive, elegant, and effective plan ... and, as a result, we were able to see an incredible number of sites and attractions in a very short amount of time. (...)What's more, though, Pablo does all of this with boundless enthusiasm and good humor. While other guides might match his knowledge of BA, he pairs his insights with a sunny, gregarious personality, making it possible to imagine that he is, in fact, your long-lost best friend from high school who has moved to Argentina and is delighted to show you around. Whatever we did, wherever we went, he scaled the opportunities available to match our interests and enthusiasm ... and that's a great trick, considering our group contained eight very different people with a range of ages from thirteen to eighty. If you are headed to Buenos Aires, do yourself a favor and contact Pablo Piera. He was the heart and soul of our first three days in Argentina. I recently stayed at the Buenos Aires Marriott Plaza from March 1-4, 2009...with the hope that we could explore Buenos Aires and learn something of its culture and origins and see not only the tourist sights, but also the typical residents view. We were traveling with four other couples thus there were twelve in our party...Based on our experience with Senor Piera, you should consider including him high on your list of recommendations ...Please allow me to give you a few details of our experience...I sent out several queries though the internet. Pable Piera responded and provided many options - set guided tours, flexible guided tours, or a mix. He also included many helpful hints for the Buenos Aires visitor. I also mentioned to him that we would be interested in a tango dinner the evening preceeding the tour...The tango dinner...which included transportation to and from our hotel. Senor Piera had arranged with the restaurant for tables in the front row of the stage. The show and dinner were excellent. He also showed up at the restaurant to meet us and make sure we were pleased. There was no charge for this tango dinner service...the following day Senor Piera picked us up at the Marriott Plaza at 0900 for a guided tour of Buenos Aires which was scheduled to conclude at 1900. This tour included Senor Piera and a clean, modern, comfortable van with driver...The most important part of the recommendation which I write to you is the cultural and social knowledge of Senor Piera. He, as many guides, knows where to go and what to see - but I am sure there is no one in Buenos Aires, in his profession, that knows the history, social aspects, cultural aspects and governmental influences as him. Each location we visited, and we visited many in our ten hours, was an education in another aspect of Buenos Aires. Included in the above were stops for refreshments at traditional places, lunch at a locals restaurant off the beaten track where the food was excellent and the service very friendly...Senor Piera is very knowledgeable, personable, polite and flexible. By the end of our day I would consider him a friend. I am sixty-six years old, traveled extensively and have never felt the need to write a note as this before. I sincerely hope you take advantage of Senor Piera. Pablo was indeed "our friend in Buenos Aires". My husband and I only speak a few words of Spanish, so it was wonderful to begin our time there with him as our guide. We asked Pablo to customize our tour to accommodate our interest in art and music. As a result, we saw and did things that were not the usual tourist activities, like going to neighborhoods with great decorated houses and street murals, and specialty music stores where we were steered to the latest in tango music. His warm, good natured and fun loving personality made us feel comfortable right from the first moments of our meeting. He did everything possible to meet our needs and ensure that our experience was up to our expectations. Spoil yourself and hire Pablo in BA for a treat of sight seeing and friendly well informed information. Trampling around a new city with guide book in hand is tiring and time wasting but setting off with Pablo walking and in taxis means your holiday starts with joy and fun. Pablo has the right balance of designing your tour,offering information, helping with transactions in the local language and never ever over stepping the mark of either being boring or selfish. This man will help you with anything to make your introduction to BA a great experience. The best money we ever spent and now we also have a friend in BA. We saw places easy that would have taken hours to find and we relaxed letting Pablo transact the discussions with cab drivers and locals on our behalf. We had the best lunch in a traditional restaurant as well. Thanks Pablo we had a ball. I am writing this note today with the intend to recommend Pablo’s service to any perspective travelers to the wonderful South America’s gem city Buenos Aires. 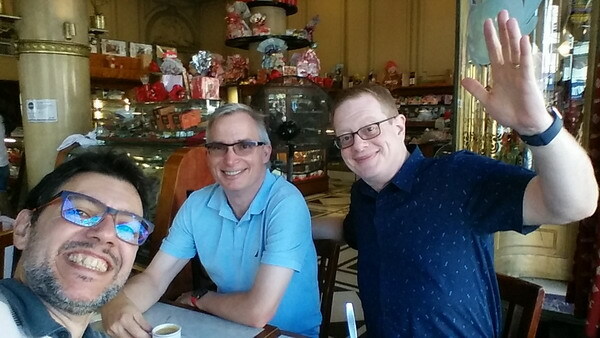 We spent 4 days of our trip to Argentina in Buenos Aires and 2 out of the 4 with Pablo. Before coming to Buenos Aires, we didn’t know what to expect since this was our first time traveling in South America. 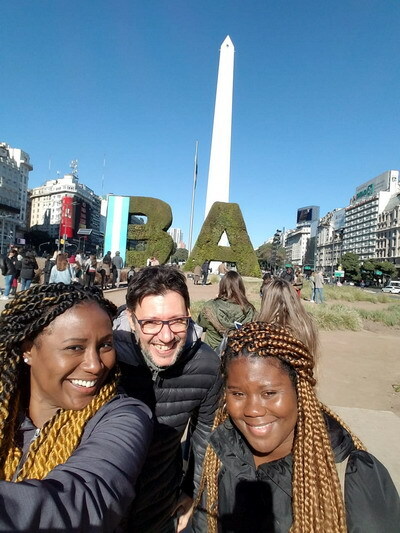 Pablo really enhanced our Buenos Aires experience ten folds, he is meticulous and thorough in his planning, his service is both personal and professional. He customizes his tour route according to your interests, time constraints and preferences coupled with his vast and multi dimensional knowledge of the city. He is warm hearted, always giving his best which always go above and beyond. He always looks after for your well being and safety as he shows you around his city. Pablo is intelligent, intellectual, and has boundless enthusiasm with a wonderful sense of humor. He exemplifies the spirit of a Porteneos and an Argentinean, genuine, friendly and passionate. After spending the time with him, you will truly feel that you have just spent sometimes with a local friend in Buenos Aires. If you read Pablo’s other recommendations in addition to mine, you will find a common theme about Pablo’s many great qualities. Therefore, if you are Buenos Aires bound, go beyond the run of the mills standard touristy tours and contact Pablo. You will have a delighted experience and he will present you the real Buenos Aires that you will absolutely falling in love with. We really wanted to see Buenos Aires but not in a "touristy" manner. After a lot of research I found an amazing guide, Pablo Piera. He picked us up from the airport and took us around BA for 3 days. Very smart, perfect english, and a great grasp of both Argentine history and world event to put Argentina into context. We did not see one museum, etc. It was all local spots I never would have found on our own. It totally changed the experience I received. As a first-time visitor to Buenos Aires, it was insantly apparent that a city as huge and lively as this must contain thousands of great stories, but I had no idea how to uncover them! I knew that Buenos Aires deserved a special introduction and I didn't want to short-change myself (or this city) by signing up for an impersonal, overpriced, dispassionate group tour. Fortunately, I found Pablo! Pablo is a friendly, educated, intelligent and gentile tour guide. He took the time to find out about me and tailor-made the tour with my particular interests in mind. He is highly knowledgeable about many aspects of the city; its history, politics, art, culture, literature, architecture, and its people! Not only is he a fascinating person with some insightful, funny and engaging stories to share, but he is very interested in learning from other people. My impression is that the city continues to inspire and fascinate him every day. Since my tour with him, my appreciation and understanding of this city and its people has been greatly enhanced. Buenos Aires should be very proud of this porteño. Don't look any further - Pablo's your man. I highly recommend Pablo Piera. Our trip to Argentina and BA was so much better because of his help. I found Pablo on Craigslist and knew as soon as I saw his web page that I wanted to hire him as a guide. The web page has so much helpful information that I used before I left for the trip. I figured if this guy was willing to share that much useful information for free, he must be good. On the web page, he lists a driver, Gerardo, that he recommends. We needed a ride from the airport so I arranged to use Gerardo through Pablo. Gerardo was sent to the wrong terminal by the airlines, so, by the time he got to where we were, we had already booked another taxi, and they wouldn’t give us our money back. Gerardo offered to take us into Buenos Aires free. We accepted knowing that we would tip him. Gerardo doesn’t speak English very well, so he got Pablo on the cell phone during our ride into BA. The moment I talked with Pablo, I realized what a great guy he is. He told us to go to our apartment, get a little rest and then go to the San Telmo Market that is open only on Sundays. This was a great piece of advice – and we hadn’t even met him yet. We hired him to take us around for one day, the second day we were there. He showed up at our place right on time. He helped us with several things we couldn’t figure out on our own, such as which taxis to use and which to avoid. During our day with him, we toured, we ate, and we changed our plans as the day went on. Pablo is easy going, flexible and knows a lot about everything in the city. He also knows a lot of people. We went into beautiful Café Tortoni to look around. Pablo didn’t recommend us eating there, but the staff didn’t seem to mind us wandering around taking pictures – probably because we were with Pablo who they greeted warmly. We ate in a restaurant in La Caminato that we never would have found on our own or gone into if we had found it. It was great – one of the best places we ate on the trip. Once again Pablo was greeted like an old friend. Every time we got into a taxi, he asked the driver’s name and made friends with him. That’s the kind of person Pablo is. He stayed with us beyond the time we had hired him for, at one point encouraging us to relax, not to worry about the time. We ended our day with him in Palermo at the bookstore El Ateneo, which we loved so much we went back a couple times. As we were leaving, the waiter followed us out and told us that the 10 peso bills we had given him were counterfeit. Pablo wouldn’t allow us to pay the man again. He took the counterfeit bills and paid the waiter himself. After that day, we used Gerardo and his taxi several more times, and each time we called Pablo who arranged the pickup for us. We called Pablo several times for advice on how to do various things. He always picked up or called back right away, and he always helped us out – for no charge. One time I asked if he knew a travel agent who could help us book a trip to Iguazu Falls. He said that he knew someone, but he didn’t know him as well as he knows Gerardo, and he was reluctant to recommend him. That made me respect Pablo even more. We were very interested in seeing a Tango show and in going to milongas, the tango salons. He recommended three places for the show, we picked one, and he called and made the reservations for us. And he got a 5% discount. The show and the dinner included were great. He gave me a sheet that he had made up of milongas he recommended with all the pertinent information about each one. When some of the information didn’t pan out, he made the necessary phone calls and looked the corrected information up on the internet for me. Pablo is a good friend to have in Buenos Aires - or anywhere. We felt that we had someone we could call on in a tough situation and he’d help me out. He’s the first person I’d call if I decided to go back to BA. Musician and after his visit, a Good Friend of mine! We went with Pablo as a guide on a whole day tour to see Buenos Aires, a city where we had never been before. It was very interesting, absolutely not a standard tour. We can recommend Pablo as a very good guide who will let you see the things you are interested in, as well as the usual things you have to see. Well we are back in St. Louis now and trying to recover from our whirlwind trip! Just wanted to again say THANK YOU for your wonderful services in your beautiful city, the "Paris of South America"! We so enjoyed meeting and being with you! You were so accommodating in meeting our wishes during our way-too-brief visit in BsAs. We feel very fortunate to have you as our "amigo". We will recommend you and your services at every opportunity. Thanks so much for a great day out today. It was great to meet with you and I really enjoyed our time. You are a great guide to this fabulous City. I loved every minute of today. Best regards, and best of luck for your very very bright future. I want to write a comment about my time with Pablo Piera in Buenos Aires. I spent an entire time with this engaging person and for the first time in Buenos Aires I stopped looking at my feet and started looking up at the detail in the buildings exterior and inside on the ceilings. Pablo's knowledge of architecture and history is extensive, he clearly has a wealth of knowledge. We also toured more mainstream must-see highlights and I had the best meal I've had so far in Argentina with him. Pablo is a charming enthusiastic companion who gives more than is asked for. Fantastic! 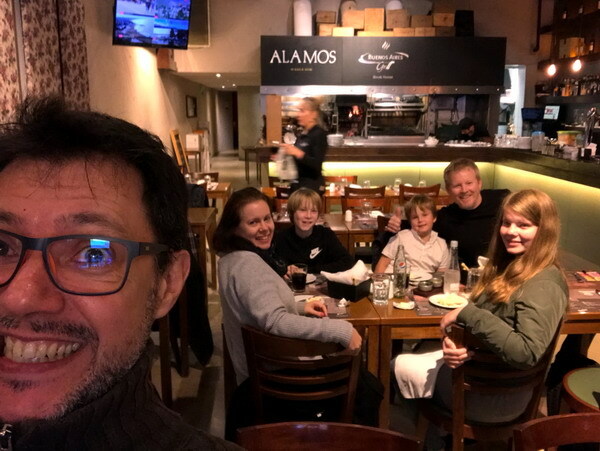 My family and I have a superb experience in Buenos Aires thanks to the great work of Pablo. Honestly the booking was last minute for me as a friend recommended OurExplorer days before departure, but we were delighted with the local insight we gained in BA. Thanks again Pablo for showing my family all the special hidden treasures of your city. I have spread the good word to all my mates in Sydney. MP.